They are so nice for lunches, light dinners and are perfect for a brunch. 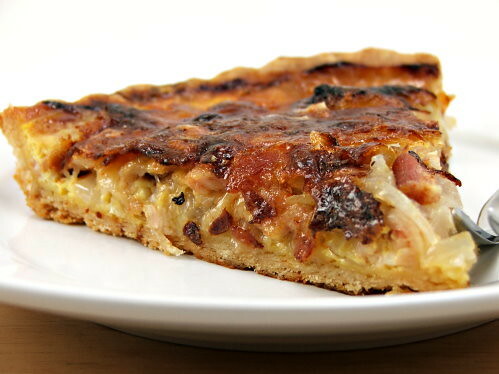 What I love about a savoury tart, aside from how nice they are to eat, is how you can vary the fillings to suit your taste and what you have on hand. 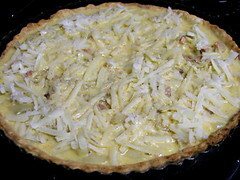 This tart was born out of what I had on hand. 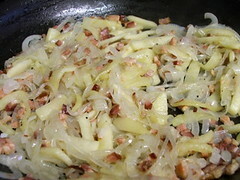 I had a bag of sweet yellow onions, a bag of apples, and some lovely thick cut bacon. 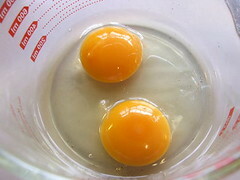 I also had some fresh eggs, courtesy of my new blog pal Mary Audet at Baking Delights! 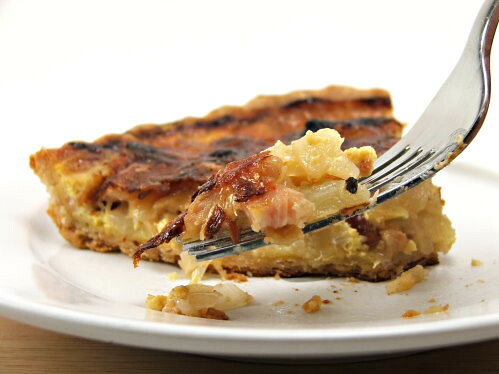 Give this tart a try! It is easy, fairly fast to make, and sure to please! 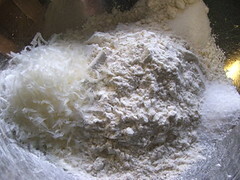 In a bowl combine the flour, salt, sugar, and cheese. 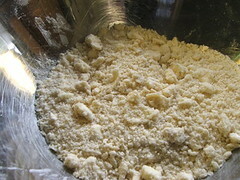 Add the diced butter and rub it into the flour to combine. Add three tablespoons of the ice water and mix to moisten. If it seems dry add the remaining water and mix. 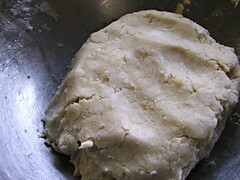 Turn the dough out and form a thin disk. Wrap with plastic and chill 30 minutes. 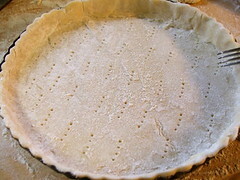 Once chilled roll it out 1/4″ thick and press it into a 9″ tart pan and dock the bottom of the crust with a fork. Place in the freezer for ten minutes to set the butter then line with parchment or foil, add pie weights or beans and bake for 10 minutes. 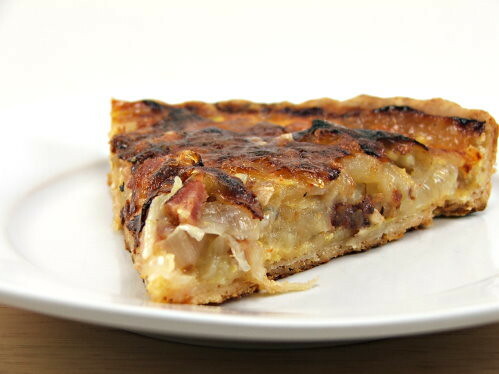 Remove the weights and bake for 10 minutes more, or until the crust is lightly brown. 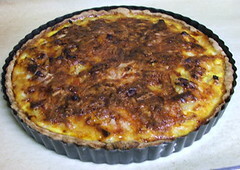 Allow to chill as you prepare the filling. 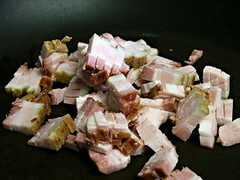 In a heavy skillet cook the bacon, over medium heat, until crisp. 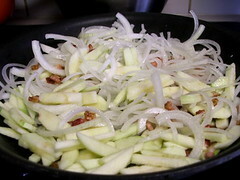 Add the onions and apples and saute until they soften, about 10 minutes. Remove the pan from the heat and allow to cool slightly. In a bowl whisk the eggs and milk together with the spices until well blended. 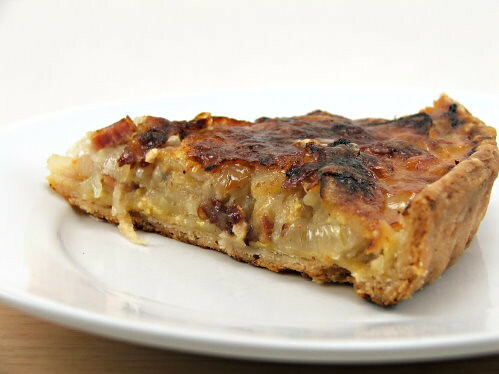 In the tart shell spread the bacon, apple and onion mixture. 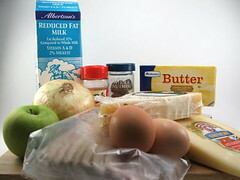 Top with the shredded cheeses, then pour over the egg and milk mixture. 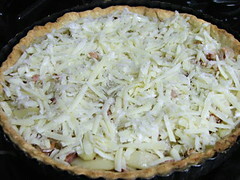 Bake at 400F for 25 to 35 minutes, or until the filling is puffed and golden. Cool for ten minutes before slicing and serving. It is also very tasty at room temperature.